I went to do a book signing at Norton Priory yesterday as it has close connections with the story of The de Lacy Inheritance. Part of the novel is set at nearby Halton Castle, the home of the barons of Halton, and it was the second baron, William fitz Nigel who founded the community of Augustinian canons in 1115 on the south bank of the River Mersey, near Runcorn in Cheshire. Paget’s disease is a disease of the bones and in days when treatment was impossible it led to deformities and was sometimes confused with leprosy. It’s clear that this man was someone of importance and records suggest that it probably was Richard. 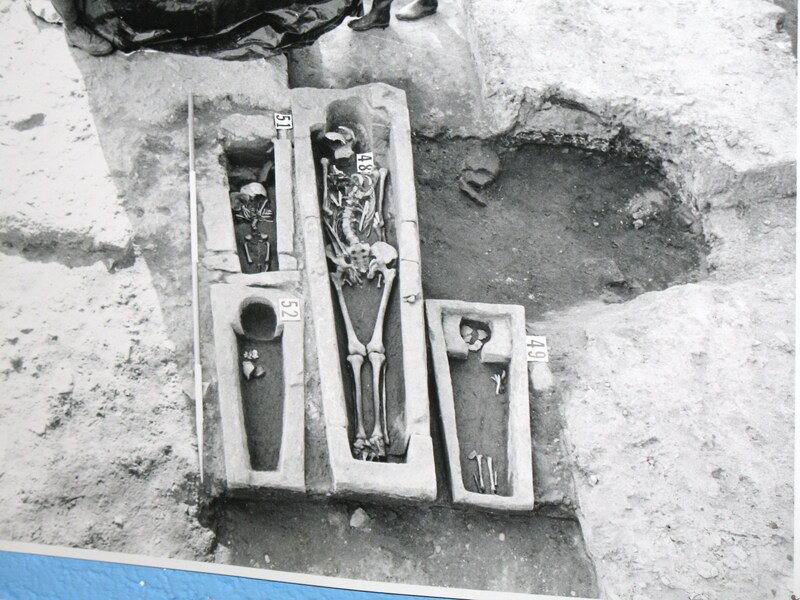 The three smaller coffins contained the remains of children and were the only stone coffins for children that were discovered. The only other member of the de Lacy family known to have been buried at Norton Priory is Alice, who was the first wife of John de Lacy. Norton Priory is a very interesting place to visit and apart from the excavated ruins and the well preserved remains of the medieval undercroft you can see the huge 14th century statue of St Christopher. It’s a rare survival of a pre-reformation religious statue. So many were destroyed on the orders of Henry VIII. 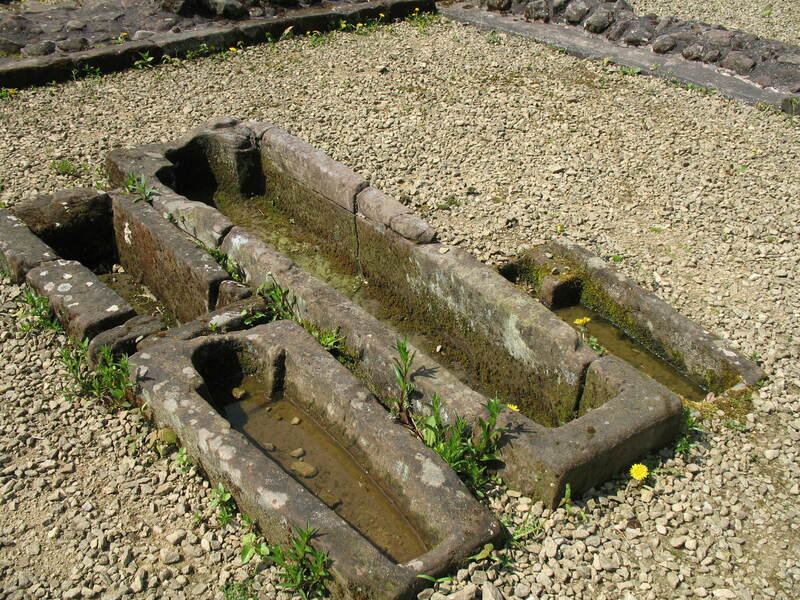 This one once stood in the courtyard of the house of the Brooke family – a house built after the dissolution of the monasteries. When the Brooke family left the house the statue remained. It was given to Liverpool Museum in 1964 and has since been restored and moved back to the priory where it is displayed in its own purpose built gallery. The statue is thought to date from around 1391 when the priory was raised in status to an abbey. It is huge, double life size, and traces of paint show that it would originally have been painted in bright colours. It depicts St Christopher carrying the Christ child across a river filled with fish and is an appropriate symbol for a monastery that was close to the river crossing of the Mersey at Runcorn. If you are in the area do go and see the real thing. It is amazing. If you need any help on the ‘de Warenne’ / de l’Aigle-Aquila’ dynasty please get in touch. Gislebertus (Gilbert) lll de Aquila, who married Isabel de Warenne Plantagenet, daughter of Isabella de Warenne of Lewes and Hameline Plantagenet, half-brother of Henry ll, King of England 1154-76, their father was Count Geoffrey V Plantagenet of Anjou. Gilbert lll & Isabel de Aquila are my 23rd great grandfather and mother. Thanks for your message. I may take you up on that offer at some point. I’m sure that you are right. I know that Isabel, the widow of Robert de Lacy did marry Gilbert d’Aquila. That their daughter should be married to John de Lacy makes complete sense. It also makes sense that John’s daughters were by Alice. I have a question mark by the name of the daughter Alice in my notes as it seemed odd that she should have that name unless Alice was her mother. I can’t find the reference for my naming her father as Peter d’Aquila, but from what you say this seems incorrect and I will edit my information to correct it. Sadly, it seems that if Alice d’Aquila’s remains were still at Norton then she too will have been removed from her original burial site. I must say that I am unhappy about the moving of the remains from the site. Some have been reburied but others are either on display or in boxes and the historians at the Priory seem to have little interest in the early burials. If I discover anything else I’ll get in touch with you. In the meantime, thanks again. What an intering place. I think the history of this Island is a great and as wonderful as any of the ancient civilisations of the world. Next So who really built the castle at Clitheroe?